Sensorialities: Information Extraction and Perceptual Grouping in the Auditory System, B.C.J. Moore. Ultrasonic Techniques for Environment Perception, D. Dotti. The Vestibular System, E. Mira. Perception and Integration: Integration and Storage of Sensory Motor Information: Computation in the Cerebellum, E. D`Angelo. Field Computation and Sensory Fusion, V. Sanguineti, et al. Panel Summary--Plasticity and Reconfigurability in Sensory Systems, S. Vallerga, et al. Perception and Decision: Solving by Redundancy and Misunderstanding by Simplification, W. Gerbino. Perception for Decision or Decision for Perception?,B.Y. Zavidovique. Perception and Action: Integrating Reflexes and Voluntary Behaviors: Coordination and Adaptation Controls in Man, G.M. Gauthier, et al. Motion Perception as an Area Process, Y. Hermush, Y. Yeshurun. Perception and Representation: Representation and Integration of Multiple Knowledge Sources: Issues and Questions, C. Castelfranchi. Symbolic, Conceptual and Subconceptual Representations, P. Gardenfors. Percepton and Communication: Picture Icon and Word Icon, J.P. Rossi, G. Querrioux-Coulombier. Panel Summary. Characters, Pixels, and Phonemes, S. Levialdi, et al. 4 Additional Articles. 4 Panel Summaries. Index. Sensorialities: Information Extraction and Perceptual Grouping in the Auditory System, B.C.J. Moore. Ultrasonic Techniques for Environment Perception, D. Dotti. The Vestibular System, E. Mira. Perception and Integration: Integration and Storage of Sensory Motor Information: Computation in the Cerebellum, E. D¿Angelo. Field Computation and Sensory Fusion, V. Sanguineti, et al. Panel Summary-Plasticity and Reconfigurability in Sensory Systems, S. Vallerga, et al. Perception and Decision: Solving by Redundancy and Misunderstanding by Simplification, W. Gerbino. Perception for Decision or Decision for Perception?,B.Y. Zavidovique. Perception and Action: Integrating Reflexes and Voluntary Behaviors: Coordination and Adaptation Controls in Man, G.M. Gauthier, et al. Motion Perception as an Area Process, Y. Hermush, Y. Yeshurun. 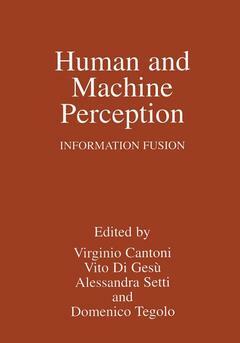 Perception and Representation: Representation and Integration of Multiple Knowledge Sources: Issues and Questions, C. Castelfranchi. Symbolic, Conceptual and Subconceptual Representations, P. Gardenfors. Percepton and Communication: Picture Icon and Word Icon, J.P. Rossi, G. Querrioux-Coulombier. Panel Summary. Characters, Pixels, and Phonemes, S. Levialdi, et al. 4 Additional Articles. 4 Panel Summaries. Index.